Bienvenidos a este reciente regimiento de caballería pesada, cuya función consiste en representar a los Granaderos a Caballo de la Guardia Imperial de Napoleón. Formado por un grupo de amigos que espera pasarlo bien, fundamentando sus actividades en el roleo de la batalla en la medida de lo posible. Los hombres de tamaño regimimiento han de ser astutos a la par que sanguinarios y valientes, orgullosos del papel que ejercen en la batalla; siguiendo su glorioso destino. Pues la vigilia y la valentía nos hará eternos en el recuerdo de nuestros enemigos. A part of the Republican Consular Guard, the Grenadiers became the senior "Old Guard" heavy cavalry regiment when the Imperial Guard was founded, in 1804. Their priviledged position the whole army -and even the Guard- had envied. Below is a short history of this splendid unit. In 1796 the Guard of Directory (Garde du Directoire) was organized and one squadron of Horse Grenadiers was raised. Soon Napoleon enlarged the troop to two and then to four squadrons. Rarely committed to battle during the Napoleonic Wars, they were usually kept in Reserve, alongside the Emperor, during the most significant battles of 1804-1815. When sent into action, such as during the battles of Marengo, Austerlitz, Eylau, Hanau or Waterloo, as well as during a number of actions of 1814, results were usually impressive. The first true engagement of the unit took place in dramatic circumstances during the War of the Second Coalition, at Marengo. As First Consul Napoleon Bonaparte was losing the battle against the Austrians, Louis Desaix's French division appeared on the field of battle. As Desaix's men charged, two separate cavalry charges helped change the course of the battle: Kellermann's brigade deployed skillfully on the Austrian right, before charging and breaking everything in its way, and on the Austrian left Bessières organised a massive charge with the whole Consular Guard cavalry and increased the panic and rout of the enemy troops. The Horse Grenadiers waited calmly under fire. 'Keep your chins up!' shouted their sergeants. Moments later they drew their sabers and charged overthrowing everything on their way. During this battle, Napoleon had planned to break the Austro-Russian centre and thus split their forces. The plan was well under way towards mid morning but a potentially dangerous situation for the French occurred when the Russian Imperial Guard under Grand Duke Constantine arrived and attacked the French from Vandamme's division around Stary Vinohrady ('the old vineyards'). At first, one battalion of the French 4th Line regiment was caught in an awkward position and broken by the Russian Guard cavalry supported by artillery, with the French battalion losing its eagle and over 400 men. Then, the 24th Light regiment, which was coming up in support of the 4th, was also thrown back in disarray. It was at this moment that Napoleon sent in his Guard cavalry: 4 squadrons, 423 men, of the Chasseurs à Cheval and Mameluke regiment and 4 squadrons, 706 men, of the Grenadiers à Cheval regiment, with a battery of Guard horse artillery in support. The grenadiers charged vigorously and clashed with the Russian Chevalier Guard regiment. After a short mêlée, the horse grenadiers broke the opponent, inflicting heavy casualties. In this battle they defeated Tsar's best cavalry. The Horse Grenadiers advanced from behind infantry clutching their long sabers and shouting. The fight was sharp but short. The Russians were thrown back and pursued until Krenowitz. Russian Guard Cavalry was defeated and only Repnin's squadron continued its desperate fight. The surrounded Russians suffered heavy casualties. The Emperor thus ordered Marshal Murat to launch the entire reserve cavalry into a massive charge. At first, Murat led forward two dragoons and one cuirassiers divisions and these men pierced the Russian line and carried on beyond, only to find themselves behind enemy lines and in serious danger of being surrounded. 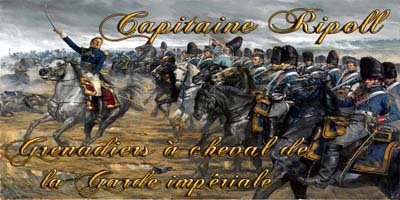 As a result, the Emperor ordered Marshal Bessières to help the stranded reserve cavalry and thus a second cavalry charge ensued, spearheaded by the Chasseurs à Cheval and followed by the heavy cavalry of the 5th cuirassiers and Grenadiers à Cheval. Commanding the horse grenadiers was colonel Lepic who superbly led two squadrons of the regiment, as they stormed through the first and second Russian lines, stopping only in front of the enemy reserves. As the handful of horse grenadiers arrived in front of this third enemy line, they were all but surrounded and the Russians at once demanded that they surrender. Lepic defiantly retorted: "Have a look at my men and tell me if they look like ones who want to surrender!" and he immediately ordered a charge, hacking his way back to his own lines. The regiment lost 4 officers dead and 14 officers wounded, as well as a large number of troopers, but the charge of the Guard cavalry did allow their fellow reserve cavalry to break their encirclement and get back to their original positions. The Grenadiers á Cheval stood under hellish fire from 60 Russian cannons, when their commander General Lepic noted some of his troopers ducking incoming shells. "Heads up, by God!" he cried "Those are bullets - not turds." Few moments later they charged and overthrew several Russian units. The horse grenadiers shortly campaigned in Spain. Not big battles just a lot of problems with the Spanish guerillas. Henri Lachoque writes: "A squadron of horse grenadiers tethered their horses in the garden of a monastery and fell into a trap. Lured by an urchin to 'come in and quench his thirst', one trooper did not return. A grenadier who went in search of him also disappeared. Some men of their troop returning from a foraging detail conducted an investigation, sabers in hand. They found the child, followed him, and discovered their two comrades with their heads cut off. They arrested 8 monks and threw them all out of the window." In 1812 the horse grenadiers were in Russia. Chlapowski writes: "There then appeared the Horse Grenadiers, in line formation. This line of black horses, its tall riders also in black bearskins, so impressed the Cossacks that they disappeared into the forest." Ten patrols of horse grenadies guarded the inside of the Kremlin. In the very end of the battle of Waterloo, when the entire French army fell apart before the Prussians and British-Netherland army, the horse grenadiers made a great impression on the pursuers. Cpt. Barton of the 12th Light Dragoons described how his regiment advanced against the giants on black horses. The grenadiers "appeared to take but little notice of our advance, when opposite their flank they fired a few pistol or carbine shots. We were ... being too weak to make an impression [on them], they literally walked from the field in a most majestic manner." In November 1815 the regiment was disbanded. On 25 November for the last time their trumpeters sounded the Ban. The standard-bearer advanced to the Inspector and presented the standard. It was the last unit of the whole Imperial Guard (infantry, cavalry, and artillery) disbanded by the Bourbons. The Guard was no more.